Stainless steel annular corrugated metallic flexible hoses are manufactured in austantic steel ANSI 321, 316, 316L & 304 grades conforming to BS 6501, Part-1. The annular corrugated metallic hose body provided the flexibility and pressure tight core of the assembly. We also manufacture highly flexible close –pitch hoses for special applications. When pressure is applied, unbraided tube tends to elongate axially; to restrain this, an external layer of SS wire braid is provided. The braid also makes the assembly pressure compatible. Sometimes two or even three layers of braiding are provided for high pressure applications. The braiding is highly flexible and follows the movement of the hose. The braid is normally manufactured in SS 304 wire. 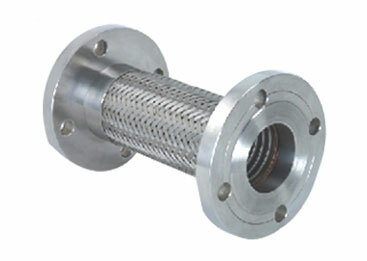 (Stainless Steel) SS braided hose are much greater resistant to bursting, and that they're relatively within your means. However SS 316 and 321 braids can also be manufactured. We also supply wire braid in different configurations as per customer specifications. High physical strength combined with light weight. Compensates for intermittent or constant movement. Compensates for thermal expansion of contraction of piping.